This brass shank hose mender by Orbit works with 5/8-inch standard garden hoses. 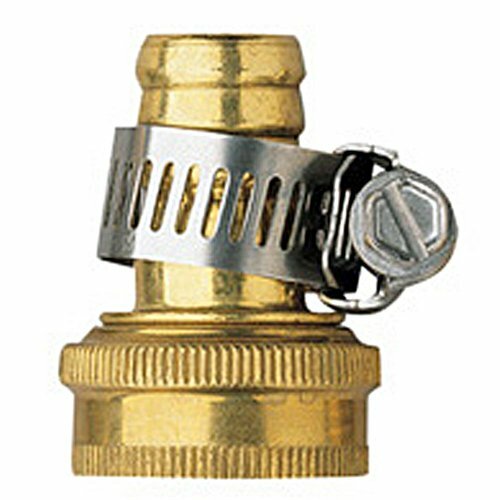 It attaches to the faucet end (female-threaded) of a water hose to extend its life. With durable brass construction and a stainless steel clamp for tightening, this garden hose repair kit is great for replacing the female end of your garden water hose. This water hose repair fitting is sturdy and long-lasting and ensures many years of dependable garden hose repair. For all your water hose fixing needs, this Orbit hose mender is perfect. Features and Benefits: Works with 5/8-inch standard garden water hoses, Great for repairing the faucet end (female-threaded) of a garden hose, Has durable brass construction.